Winston Churchill held several important political positions in Great Britain during World War I, including First Lord of the Admiralty. Between the wars he was a Member of Parliament but held no cabinet post. In the Thirties he was out of office and politically “in the wilderness.” During this time he was a vocal supporter of rearmament and an opponent against Prime Minister Neville Chamberlain’s policy of appeasing Hitler. After Britain’s declaration of war on Germany on Septem­ber 3, 1940, Churchill was invited back to into the cabinet. On May 10, 1940, following the resignation of the ailing Cham­ber­lain on the day Germany invaded France and the Low Countries, he moved from the First Lord of the Admiralty to the Prime Ministership. 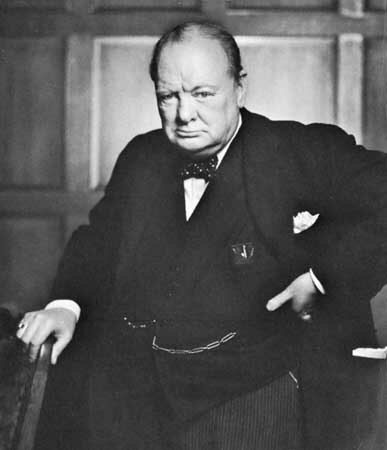 Churchill guided Great Britain through all six years of that nation’s war with the Axis Powers. His fortitude, strength of character, and his oratorical skills served him and the nation well, especially prior to America’s entry into the global conflict. His relationships with President Franklin D. Roosevelt and Soviet dictator Joseph Stalin were critical in undoing the ascendancy of Nazi Germany in Europe, offering as he did his country as a supply platform for the Soviet Union and for the liberation of Western Europe from Nazi tyranny. British elections in July 1945 saw the defeat of Churchill’s political party and his exchanging chairs at the four‑power victors’ conference in Potsdam, Germany, in July of that year. The change at 10 Downing St., the Prime Minister’s residence, was not a backlash against Churchill’s wartime leadership but the political fallout of a public tired of wartime hardship wanting a peace dividend.